Tuesday February 19 1907 I was busy about the house all forenoon and sewed in afternoon and evening. I do not feel very well myself Will hired Billy Coyle to work for the summer He comes out tonight. 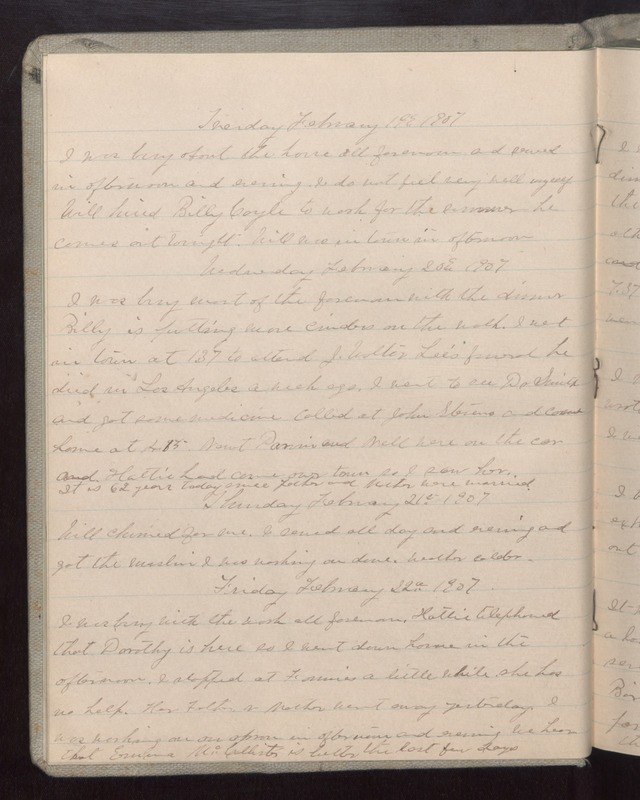 Will was in town in afternoon Wednesday February 20 1907 I was busy most of the forenoon with the dinner Billy is putting more cinders on the walk. I went in town at 1.37 to attend J. Walter Lee's funeral he died in Los Angeles a week ago. I went to see Dr Smith and got some medicine Called at John Stevens and came home at 4.15. [Newt Parris?] and Nell were on the car and Hattie had come over town so I saw her. It is 62 years today since Father and Mother were married. Thursday February 21st 1907 Will churned for me. I sewed all day and evening and got the muslin I was working on done. Weather colder. Friday February 22 1907. I was busy with the work all forenoon. Hattie telephoned that Dorothy is here so I went down home in the afternoon. I stopped at Fannies a little while. She has no help. Her Father & Mother went away yesterday. I was working on an apron in afternoon and evening We hear that Emma McCallister is better the last few days.